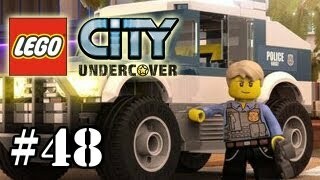 This is a walkthrough of how to get 100% of the collectible items in the Fort Meadows section in LEGO City Undercover (Wii U). This was done in a single continuous run to show exactly where everything is. It is highly recommended that you have the super color gun and unlimited dynamite turned on while doing the overworld exploration. #LEGO #LEGOCity #LEGOCityUndercoverThis area contains the following collectible items. See the time codes listed below in order to skip directly to any particular collectible in this video.00:10 - Gold Brick #1 - Super Build #1 (call-in point) 00:20 - Vehicle Token #1 - Torsion (from super build) 00:39 - Gold Brick #2 - Free Run 01:34 - Character Token #1 - Vampire (from completing free run) 02:25 - Character Token #2 - The Monster 03:55 - Red Brick - Data Scan Upgrade - Tokens 04:23 - Gold Brick #3 - Alien Caught 05:30 - Gold Brick #4 - Boulder Destroyed 05:45 - Character Token #3 - Cave Woman 06:18 - Character Token #4 - Farm Worker Bob 06:30 - Gold Brick #5 - Coffee Break #1 06:51 - Gold Brick #6 - Drill Thrill 08:33 - Character Token #5 - Dougy Dungarees 08:50 - Gold Brick #7 - Super Build #2 (lumberjack's log cabin) 09:20 - Character Token #6 - Lumberjack 09:30 - Gold Brick #8 - Cat Rescued 10:00 - Character Token #7 - Buddy Weingartner 10:15 - Character Token #8 - Farm Worker Bill 11:20 - Gold Brick #9 - Super Build #3 (emergency crash mat) 11:38 - Vehicle Token #2 - Slicker (from super build) 11:40 - Gold Brick #10 - Silver Statue Destroyed 12:00 - Gold Brick #11 - Super Build #4 (fort meadows train station) 12:25 - Gold Brick #12 - Train Station Activated (automatically get from building the fort meadows train station) 12:35 - Character Token #9 - Train Driver Bob 12:58 - Gold Brick #13 - Disguise Booth Activated 13:10 - Character Token #10 - Gas Station Manager (from disguise booth) 13:20 - Gold Brick #14 - ATM Smashed 14:10 - Gold Brick #15 - District Conquered 14:25 - Gold Brick #16 - Pig Returned 15:25 - Character Token #11 - Rooster 16:22 - Gold Brick #17 - BBQ Fire Extinguished 16:47 - Gold Brick #18 - Flowers Watered 18:47 - Gold Brick #19 - Coffee Break #2 19:10 - Character Token #12 - Bea Heckerson (This requires you to destroy 3 hay barrels and build a scarecrow out of the remains. Scarecrow #1 - 15:09, Scarecrow #2 -17:25, Scarecrow #3 - 18:32) 19:18 - Character Token #13 - Stinky Fletcher (This requires you to paint 3 hay barrels yellow. Hay barrel #1 - 16:37, Hay barrel #2 - 17:17, Hay barrel #3 - 18:12) 19:45 - Character Token #14 - Highland Battler (This requires you to paint 3 wheelbarrows blue. Wheelbarrow #1 - 02:00, Wheelbarrow #2 - 16:10, Wheelbarrow #3 - 17:52) 19:54 - Gold Brick #20 - Time Trial Completed 22:15 - Vehicle Token #3 - Armadillo (from time trial) 22:28 - Gold Brick #21 - Gang ArrestedGold Brick #22 and Vehicle Token #4 are not pictured. These 2 collectibles are automatically collected during the story mode when you build a super build (call-in point) at the gas station early in the game. Just a few weeks ago I found this super strength crate on the north east end of Blackwell Bridge. I'm sure many of you found this long ago, but I was astounded that I either didn't see or ignored this super strength crate for so long. Anyway, this video shows me opening the crate the building a handcar for the railroad in LEGO City. If you are going forward you need to tap A to keep moving so it can actually get a bit tedious after 5-10 minutes. When you are in reverse you just need to hold in the B button. Anyway, I guess I missed this vehicle in my locomotivetrain guide so I apologize about that.